Allegheny Site Management (ASM) on 4001 West Washington Street in Bradford, Pennsylvania, operates 20 locations throughout the Allegheny National Forest, offering tent and RV camping, as well as cabins and boat rentals, to accommodate all of your recreational needs. The Allegheny Site Management offers primitive to developed camping areas depending on your preferences. Campers not using the reservation system can find first come, first serve sites. Extended services include paddle board, canoe, and kayak rentals, season passes, and interpretive programs. 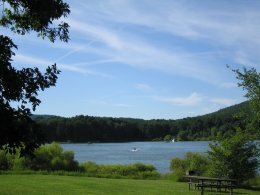 Enjoy year round activities in the Allegheny National Forest including fishing tournaments, geocaching, hiking, mountain biking, fishing and fly fishing, boating, canoeing, kayaking, wildlife viewing, gathering, tent camping, hunting, ice fishing, winter camping, cross-country skiing, and sledding. 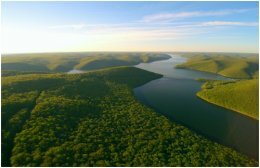 Pick from one of seven boat launch areas on the reservoir: Willow Bay, Elija Run, Webbs Ferry, Roper Hollow, Kiasutha Recreation Area, Dew Drop Recreation Area, and Kinzua Wolf Run Marina. Kayaks, canoes, and paddle boards are available at Willow Bay and Kiasutha. For prices, call Willow Bay Ticket Booth: 814-368-4158; or Kiasutha 814-945-6230. Reservations for campgrounds can be made through www.recreation.gov, via telephone or internet. The toll-free number: 1-877-444-6777 TTY. Daily: Memorial Day Weekend through Labor Day Weekend; with some weekends in September. Some camp sites are available year round.